Installed the game in D:\_GRY\Machinarium, uninstaller gives default path without last folder (D:\_GRY) and after clicking "uninstall" it permits to delete ALL content of D:\_GRY. What if I installed the game to C:\Machinarium. Uninstaller would give C:\ as Machinarium installation path and therefore permit to delete ALL data on C drive - seriuos bug. I wasn't able to reproduce this, both with the original build and the updated one. 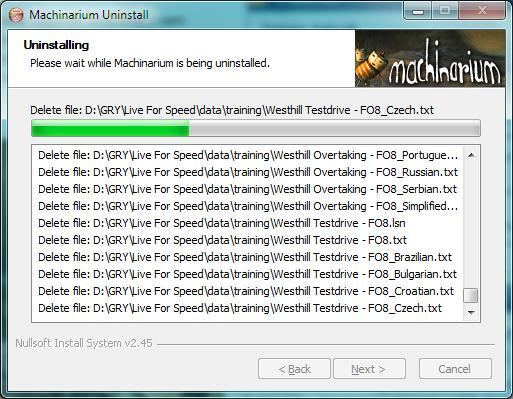 I took exactly "D:\_GRY\Machinarium" and "D:\GRY\Machinarium" as install pathes. No problem when uninstalling. You are certain you didn't install the game directly to the "_GRY" directory? Then I would understand why it's trying to remove all these files. It's possible to write a log but this has not be scripted in that case. At end of the file deletion the script tells the uninstaller most likely to remove the install directory. It would certainly be safer to make a check to determine if the folder is empty before pulling the trigger. So maybe add this log so that uninstall process could be safer. Maybe in first post the problem was a PICNIC problem, but uninstaller can be much safer in fact. EOT, just wanted to point that out.